Thank you for sharing this! It looks amazing. I’ve been craving the cabbage salad at the local Vietnamese place lately, and this looks like it has some of the same flavors. Can’t wait to try! It sounds so fresh and tasty. I can’t wait to try it. this salad sounds amazing!!! can’t wait to make it! thank you for sharing! I’m still working on figuring out how exactly I am a vegetarian who doesn’t really love salad…but I am. I’m working on it though because I think the thing is that I don’t like salads that aren’t GOOD and there are far too many of those out there. Which probably explains why I skipped over this when Deb posted it…but obviously I need to take a second look! How do you think this would taste using regular green cabbage instead of Napa and daikon instead of red radishes? That’s all I have on hand right now and I really want to try this. Hi Holly. 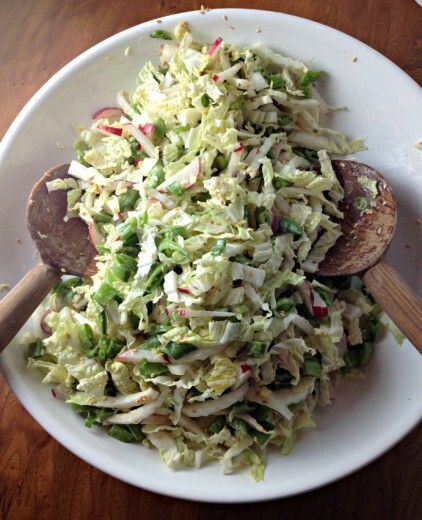 If you are diligent about slicing the green cabbage really thin, it will probably be fine. 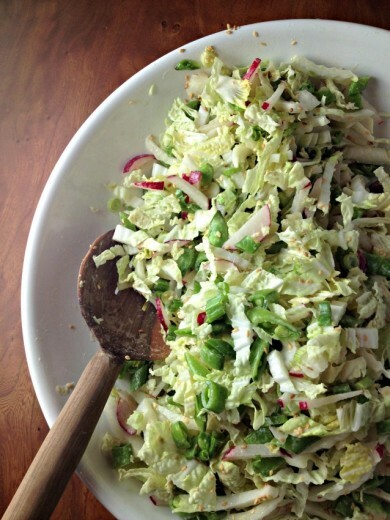 If you use that, I would definitely dress the salad ahead of time since green cabbage is a little heartier than Napa. The dressing ahead will allow it to soften. The daikon would be great, just cut in in small slices. 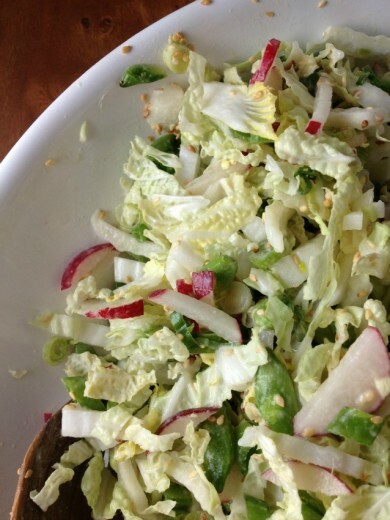 This miso dressing sounds great! I actually have every ingredient which makes me want to whip up this salad right away. Love the mix of radishes and sugar snap peas. I get crushes on salads regularly. This one sounds good – I’m always making tahini dressings in the wintertime and have added water instead of oil too. I don’t eat a lot of snap peas except in stir fries so I’ll give this a go. It looks delicious! Keep on crushing! Just wanted you to know that after three helpings, Nikhil declared this the best salad *ever*! Glad I made double the dressing, as he wants it in his lunch tomorrow. Thanks again!